As we gaze and gawk at the Pottery Barn catalogs each season, those first tendencies to compare, complain and covet can get us, can’t they? Well, I may be speaking for myself, but I can’t help mourn the fact that my home will never look like that. So instead of settling, why not let those pages inspire and pull out all those frugal, creative juices that have been waiting to emerge after a long winter hibernation. With yard sale season nearly warming up, $1 lamps will be a plenty to a good home. Decorating on a Dime by spray painting those ugly gold ladies will never be easier. The white flower lamp above can easily be created by spray painting the base Heirloom white and then hot gluing white flowers around an old ugly shade. My daughters’ room cries to be updated, and the first place I am beginning is with their light fixtures. 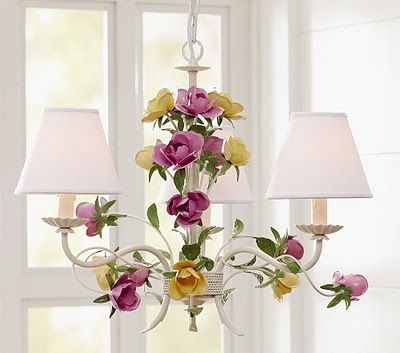 I had a similar chandelier to the Pottery Barn one above waiting patiently in our attic for ten years before I finally donated it to Goodwill. Literally, the month after I did, I wanted to spank myself because spray painting the horrible brass a perfect white, and adding some fun flowers, hanging crystals and gems would be a fantastic alternative to the builder brass fixture in their now. This yard sale season, searching to “re-buy” my fixture, as well as finding a small crystal chandelier for my laundry room tops the “Things to find” thrifting list for spring . One of my best IRL friends, Rebecca, took what she had and went with it when updating her daughter’s room. A hand me down table in a horrible wood color graced her presence and she knew that sporting a pretty purple was just what it needed. Then wanting to match her old lamp, she updated the base with an easy coat of white spray paint and then spent her time getting to know her hot glue gun. Be prepared for some gluey fingers, but taking any old shade can be transformed with a little effort. 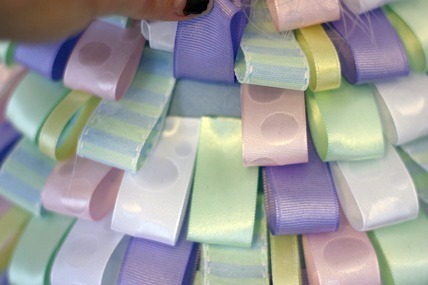 Cut your strips of ribbon even, begin at the bottom slowly gluing around the edge and then work your way up the shade. It’s so cute, and what a wonderful love gift to her daughter. Sweet Jen, From Tatertots and Jello took her shade from Dull to Daring in just thirty minutes. 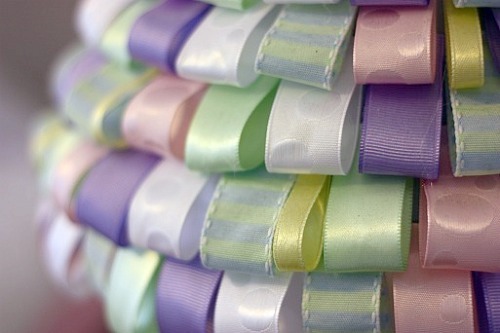 You know that is my kind of project, and why I love paint and fabric so much. 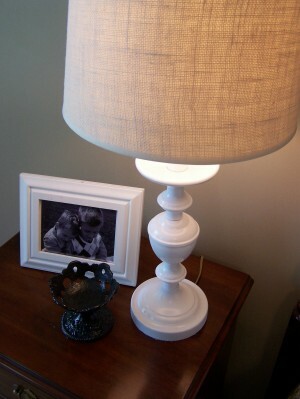 And since most of these projects are for those sweet girlies and ladies in your life, one of my best blogging friends, Kimba, gave us these fantastic DIY burlap covered lampshades in less than an hour. She used them in her master bedroom, but how perfect would they be in a boy’s room? Once we get some side tables for our teen boys’ room, I will definitely be referring to this post. So, are any creative juices flowing yet? Remember, we make our choices whether its with our family time, finances or even our home decor. Don’t let Pottery Barn get you down, use those pages to ignite and spark something that you haven’t thought of before…that’s my choice. 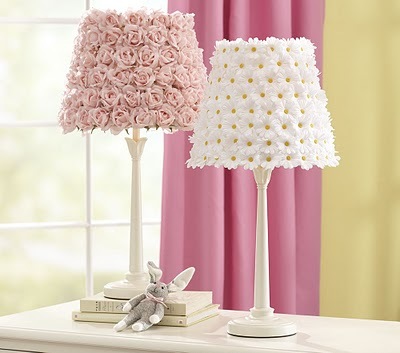 Oh my gosh these lamps are so cute and fun BUT how do you dust them? As I get older I think about housework, alot, and actually I hate dusting. Think you could use the brush on the vaccuum cleaner???? Or maybe when they get too dusty just go to a garage sale, buy a shade, decorate it, and use it til it gets dusty?? Repeat. You are SO right! And you have SO inspired me with your creations. That is one reason why I believe in DIYing. I believe it’s just plain smart. We are commanded in Scripture to make the most use of the resources God gives us, and this is part of my interpretation of it. Also, I’m trying to save the landfill, one DIY project at a time. Almost all of my lamps are thrift store treasures. I tend to paint them black. 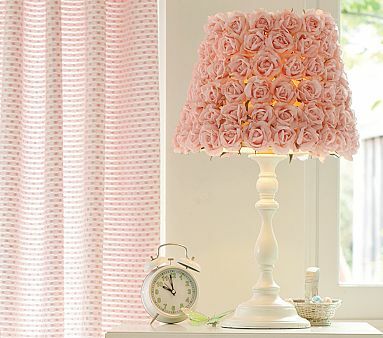 I’d really like to try the rose covered shade for my daughter’s room. It’s beautiful! Super cute ideas, Jen! I choose to gather inspiration from Pottery Barn catalog and the store, too. It’s so fun to be a queen of copy and on a budget makes it even more fun! These are perfect for what I would love to do in my daughters room. Thank you so much for the inspiration! I agree.. totally awesome.. Thanks for the inspiration. I have a craft room that Im “working on” and its short of light.. 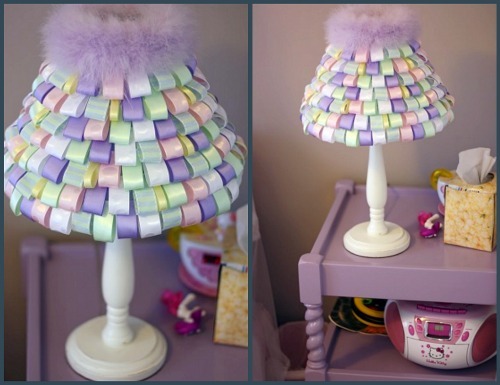 These lamps are adorable and cute too.. which is where Im going with this craft room. Thanks so much! 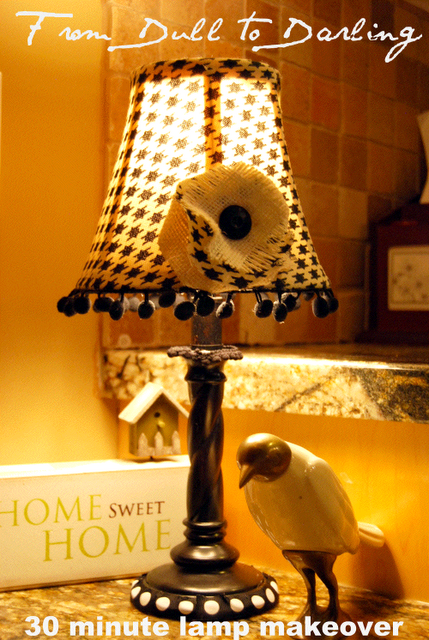 I would recommend really considering this option before you decide… I added some flowers and touches to some old lampshades years ago and they are very hard to keep clean/dust free. I know there are ways and periodically I take the time to do them for most often they just look dusty and nasty. Just a thought. Oh my gosh Jen, I LOVE these ideas! Can’t wait to do those flower shades for my girls! 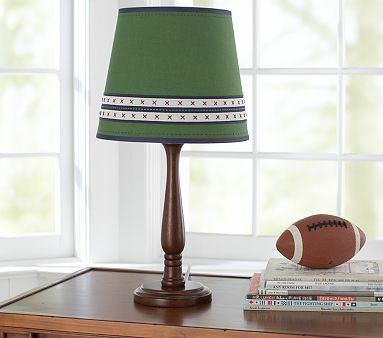 I wanted to get new lamps for my living room and I may just have to redo them! Thank you for the inspiration! Being inspired by the creativity of others is certainly a blessing – I am often gleaning good ideas from books, blogs and magazines. I love to bring beauty to our home and make it place of blessing for all who enter here. I have learned so much and enriched my life and our family by doing so, but I know for myself I have to exercise ‘extreme caution’ when I am browsing for ideas. I quickly stumble into trouble when I start comparing our home, our children, our possessions or myself to others – and generally fall headlong into sin. Either I compare and find our home somehow lacking and fall into envy in a big way, or I compare and find that we have it so much better and assume a lofty, superior attitude that does not bring glory to God. When I realized that my sinful habit of comparison was filtering down to our daughter, I made some changes in my attitude, my conversation with the children, and in our ‘exposure’. Looking at the Sunday sale fliers generally lead to thinking we ‘needed’ something that we really didn’t. Now the fliers go directly to recycle. I called all of the catalog companies and had us taken off the mailing lists – I miss the inspiration, but not the coveting. Whenever I am tempted to compare our home to others and find it somehow lacking (and it’s such an easy thing to fall back into – especially since we look out our window at huge estate homes) I start counting our blessings. I remember the 14’x22′ cement block ‘homes’ our church’s missions team helped construct in the DR a few years ago and the radiant joy on the faces of the families that moved in – to what wouldn’t be fit to house our cars here in America. We are so rich – even in a messy little house with outdated decor, cantankerous plumbing and not a single ‘Pottery Barn worthy’ accessory in sight! Amen, amen and amen…enough said on that. 🙂 Thanks for sharing your heart. I’m so anxious for garage sale season this year! I didn’t go out much last year since taking the kids was so hard. This year the youngest is 2.5 which will still be a challenge but better. I’ve been so inspired but your frugal fashionista posts, I hope to do more shopping for myself in the future. Usually I get through the piles of kids clothes and the kids have had enough and are ready to move on. Let the treasure hunting begin!!! All of the lamp shades are beautiful!